GODLIKE BlueMarble M Origin Tip #1: Gameplay. This session will guide you through the game system and how’s it work, and let you understand the game mechanics. Upon first turn, the opponents are randomize and player with the highest total will goes first. 2. Watch for the charge gauge, player may indicated how far they will goes by observe the charge bar. 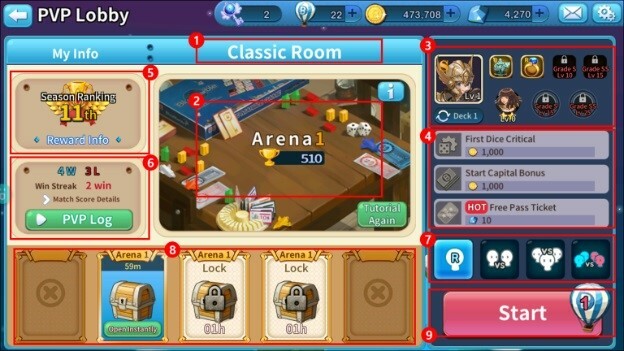 For example, If player want to goes for 5 steps then player must charged and then release when the gauge hit number 5, This action will depend on player's dice the higher grade will granted more precise result and effect. Beware the danger zone, the dice will rolls out as a skull dice and stops on a random number. 3. Player can do extra dice roll whenever he or she roll a double. 4. Roll to move clockwise around the board according to the total number on the dice. toll when land on your property and they may take over your property. Of course, likewise you have to pay rent whenever you land on an opponent's property and may take over them. 5. 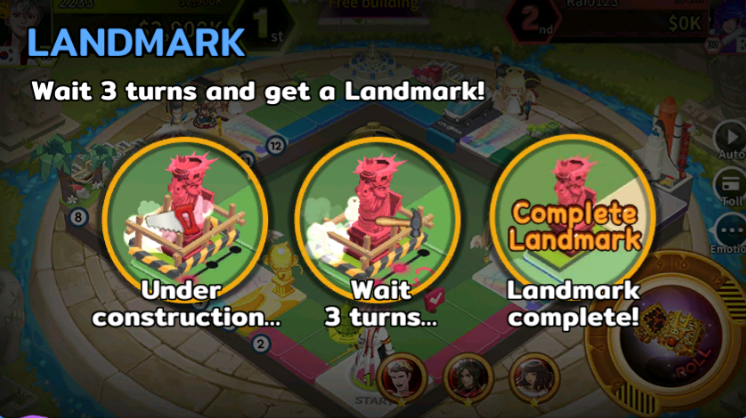 Landmark construction will take 3 turns, but when the owner visit those square on one of three consecutive turns, the Landmark will complete instantly. And the opponent can take over before it is complete. 6. Touch the square to see the information. 7. Player received rewards and rank point upon winning. 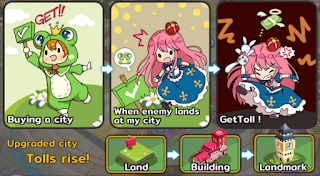 Yuna, NPC will guide you on how to win the game, there are 3 conditions. cash to pay the toll. 3. 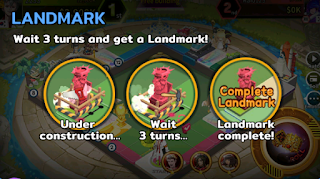 END OF TURN - Game will end after 25 turns, the wealthiest player win the game. - You can check out the heroes you have and the entire heroes at [Heroes]. ① It shows the name of hero, acquisition and wearing status. 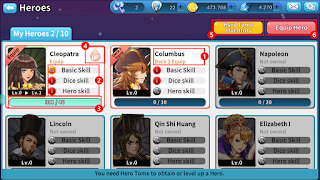 ② Hero Displays the current level of each skill. ③ Displays the current quantity of hero tomes and the quantity required for upgrade. ④ Displayed when you can level up your hero. ⑤ You can see the total hero tomes list and the number of hero tomes you currently have. ⑥ Move to the screen where you can mount or release hero. GODLIKE BlueMarble M Origin Tip #2: Hero Management. ② Displays hero's current skill level and skill effect. ③ Displays the hero book and the current hero stand quantity required to raise the level. ④ Touch the button to consume gold and raise the level. ⑤ You can see the hero's biography on the [Biography] tab. - You can move to PVP by [Lobby] → [PVP]Button. ④ You can choice and equip with star item. GODLIKE BlueMarble M Origin Tip #3: Deck Management. 2. 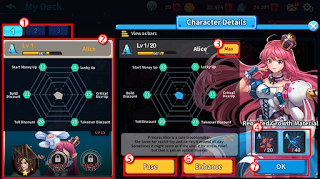 You can see the character on the [Deck] screen. ①. You can replace the [Deck] by touching the tab. 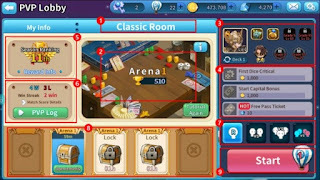 ②.Check the currently selected [character rating], [level], [OOPArtz], [Hero] and [skill information]. ③ You can check the list of characters you have. ④ Sort the characters you have in order of grades or level. 3. When touching a character from your character list,you can check the character details. 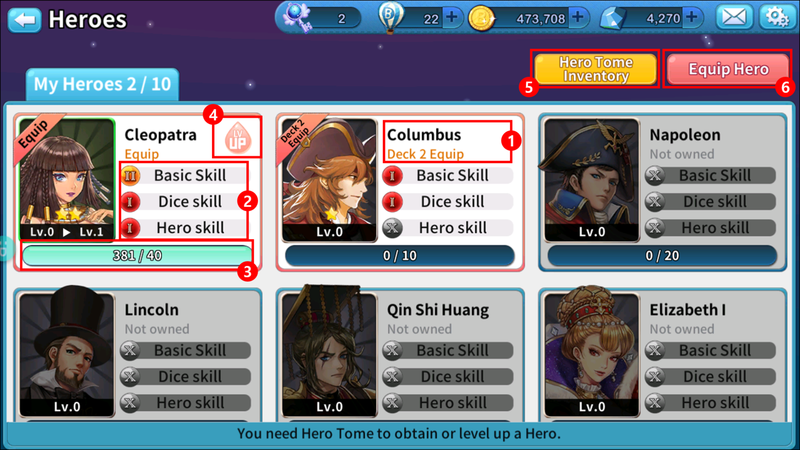 ② You can check the character grade, level, and stats of the selected deck. 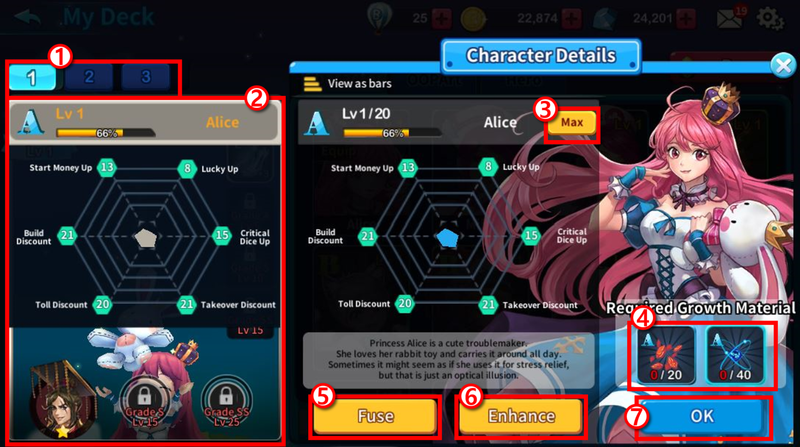 ③ You can preview the character's MAX level of stats. - If you consume a certain amount of gold on two MAX level characters and the material acquired through the exploration mode, you will be upgraded to the next grade. - Growth Material : You can get it from the expedition or get it from spend mount of Marble gem.